Excuses out of the way, this is perhaps the most annoying part of any fix for the DIY mechanic. The Pierburg 2E3 carburetor is a marvel of confusion and complexity that has led most people to switching to more ‘reliable’ carbs such as Webbers. Well the Pierburg 2E3 is not the worst of instruments, with a little patience and lots of knowledge you could get it working like a charm. Common problems caused by the carb are poor idling (too high or completely non-existent), very poor running during a cold start, fouling of spark plugs due to too rich a mixture or other problems due to too lean a mixture and of course the worst of them all poor fuel efficiency. I shall attempt to guide you on what to do to try and iron out some of these issues assuming everything else that the carb is dependent on such as distributor and engine timing are working well. Most common problems will also be solved with a good cleaning of the carb using carburetor cleaner. Spray the carburetor jets and linkages occasionally and they will run problem free. Frequent fuel filter replacements will also do your carb a world of good. 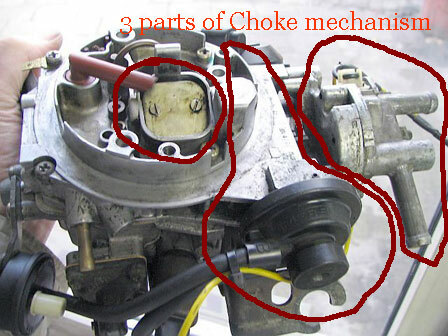 A choke is meant to actually ‘choke’ or starve the carburetor of air when the engine is cold so that the richer mixture is ignited easier. As the engine warms up a bi-metallic strip uncoils as it senses the increasing engine temperature. This sensing of engine temperature happens with the help of coolant that is ran through part of the carburetor’s choke mechanism. The choke works hand in hand with a mechanism called fast idle cam that if well set, keeps idle speed high and reduces it with increasing engine temperature. There is an additional component that helps heat up the bi-metallic strip using electrical energy from the battery. This usually helps open up the choke faster than the water would. From my experience, it is not very important here in the tropics since we hardly have very low temperatures and furthermore, it keeps failing. I’ve totally disabled it in my van and I am running just fine. The aim is to set the choke (butterfly) gap such that when the engine is at its coldest it leaves a gap along the barrel that is only small enough to accommodate a 3mm drill-bit and the fast idle cam can cause idle speed to rise to 2000 +/- 200 rpm. Push the pullrod on the choke pull-down diaphragm the furthest it could go and check the gap left when the bi-metallic strip is turned to the ‘start’ position. Turn the screw that manages the pullrod in or out accordingly until pushing the pullrod furthest in will lead to a 3mm gap between the choke butterfly plate and the barrel, when the bi-metallic strip is turned to its ‘start’ position. Refit the choke body ensuring that it remains on the ‘start’ position when coldest. Fast idle should also be adjusted hand in hand with the choke pull-down diaphragm but when the engine is warm and at normal operating temperature. The unseen evils that can shorten the life of your engine significantly are air/fuel mixtures that are either too lean or too rich. Too lean a mixture is one that has an excess of air while too rich a mixture is one that has an excess of fuel. This condition is managed by the mixture screw which under ideal conditions has a tamper proof cap on it. But should your mixture settings be tampered, adjust it using this screw by turning it in for a leaner mixture and outward for a richer mixture. Drive the van for a while preferable over 80kph for some significant distance, remove the spark plugs and examine them to determine the state of your mixture. Once there is no vacuum leak or any other carburetor problems and the engine timing is correct, the idling speed can be adjusted. This is done by simply turning the idle speed control screw. However, it might be important to adjust it using the mixture screw as well. This will tell you if your engine is running right. Not much thoughts on connecting air filter to exhaust system. No experience with that. SS exhaust and all sounds fantastic! All the best! Think its to do with extreme cold conditions, just don’t like things missing and not right. see how it goes. Adjusted my carb down to two, only short about town run today and fine, but will wait for longer run and adjust off plugs. Have a colour tune, either its nackered or my eyesight is! Worked well on my old Cortinas and T2. Ref SS Ex really impressed by it, built and fitted by a guy called Charlie (Pro Speed Cardiff) £650. Used different system to original and I’ve the quite running I wanted, but a lot smother with more power and I think my MPG will be better. Also if I need to drop the engine, it wiil be much easier. Been looking around for ages for good SS ex, and I think for once its worked out good. He’s top lad very ‘can do’ and helpful. Some places are asking more than that just to sell you a system, then quote inflated £ per hour to fit it! And the one which cracks me up is, we might come up against some dodgy bolts&nuts ect! Yeah this is to be expected, why can’t they just say this is the price then get on with it. Thats, where my respect goes to Charlie, rate him big time. Hello Jon! I can imagine how terrible a leaky Pieburg 2E can be. There’s are these guys in the UK https://sites.google.com/site/pierburgcarburettorrepairs/Pierburg-carburettors. See if they are helpful. Cheers!